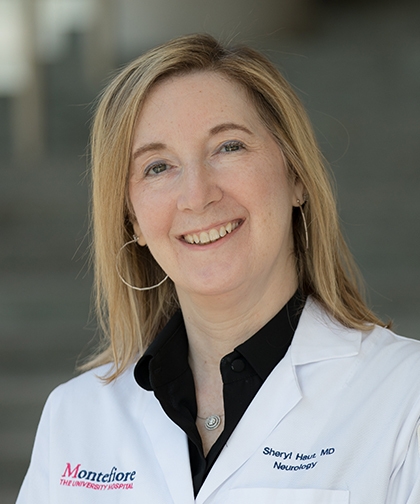 Dr. Sheryl Haut is Director of the Adult Epilepsy Program at Montefiore. She has extensive experience treating all forms of epilepsy in young and older adults, and in tailoring treatments to the individual. She focuses on special needs such as pregnancy, stress, driving, work related issues, and issues in the elderly. Dr. Haut has an extensive research background, including a Masters of Clinical Research with Distinction from Albert Einstein College of Medicine. Her research interests focus on seizure clustering; seizure prediction and pre-emption; and alternative therapies for epilepsy. She is one of the first investigators to run a clinical trial of stress management for epilepsy, using smartphone diaries. Dr. Haut is the current Chair of the North American Commission of the International League Against Epilepsy, and is active nationally in the American Epilepsy Society, and the American Academy of Neurology, serving on committees of both organizations. She has authored more than 50 papers/book chapters on epilepsy, and has been featured in Top Doctors of NY annually since 2009. She maintains an active adult epilepsy practice at the Moses Campus.